It is beneficial to have a clean and organized workspace dedicated to school. This area should limit distractions and be conducive to learning. Chromebooks, iPads, tablets, and smartphones offer limited functionality in our program. While your child will be able to do minimal work using these devices, it is recommended that content be presented to a student on a laptop or desktop. A speaker (built-in or external), a headset, and a webcam may be additional computer accessories that will make Class Time and your child’s learning experience much more enjoyable. It is highly suggested that your child has convenient access to a printer. There is no need to print everything; however, your child will greatly benefit from being able to print worksheets to complete that will be submitted for a grade. We want to encourage good study habits and in doing so, we recommend your child have a spiral notebook to take notes in as they move through the lessons for each course. Use a teacher crate, bin, or binder(s) to house all the work your child completes to document their progress. This may be provided to your school district depending upon your county’s homeschool evaluation requirements at the end of the year. A 3-hole punch is a good idea if you choose to house your child’s work in a binder. Before being activated, your child’s teacher will reach out to complete a Welcome Call with you and your child by phone. This is the perfect time to ask any questions, give the teacher any pertinent information about your child, learn how to find your way around within the course, and set a successful pace. As soon as your child is placed in a course, he or she will be able to explore the curriculum and start submitting assignments. Need help getting organized, planning your schedule, or setting goals for your student? Talk with your teacher if you are having difficulty finding a groove. Remember, “no pace” is not a pace. Your child needs to make continual progress to master new concepts and material. Each student must submit work at least once every seven days. After seven days of not submitting work, your family may receive a concerned call from the teacher with suggestions and support for helping your child get back to work. Remember, our teachers are here to help and want your child to be successful. They can offer success plans and answer questions to help get your child back on track and working successfully. If you or your child are feeling a bit overwhelmed, talking to your teacher should be your first course of action! Setting a schedule and sticking to it will also help. Following a daily schedule is a best practice for successful online education. If your child is a traditional school student who is taking individual courses, you should expect them to be working 1-2 hours per week per subject, depending on the course and weekly content. 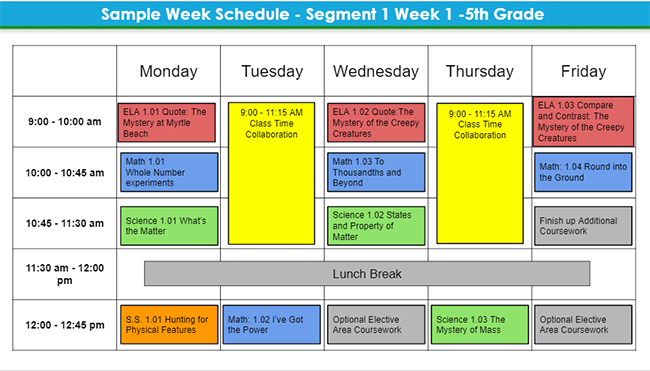 Below, you will see a sample weekly schedule for fifth grade students who are enrolled in multiple courses. If you are enrolled in segment 1, you will begin in lessons 1.01. Segment 2 students will start later in the courses. Please know that you can create an individualized schedule that fits your family’s needs. Partnership between you, your child, and your FLVS Flex Elementary teacher is imperative for success. Aside from parents, your child’s teacher is the biggest supporter for your student. Maintaining regular communication with them will greatly benefit your online educational experience and help to ensure your child’s success. Online education is certainly not something to jump into without thought or planning. As you know, there are many things to consider when beginning this journey, like how to structure your days, whether or not to find and join a local co-op for homeschooled students, and which courses to choose. We are very glad you have chosen FLVS Flex Elementary to serve your family’s educational goals. We can’t wait to continue serving each family to help all students reach their educational potential. This entry was posted in Full Time Edition, Homeschool Edition, Parent Edition and tagged Elementary, Elementary Homeschool, FLVS Elementary, Online Elementary Curriculum, Online Elementary School, Virtual Elementary School on February 25, 2019 by Allison Voltaire.